Heavy fuel oil is a product of the refining of crude oil and is used as fuel in variety of engines and boilers both on land and in ships. It contains many environmental polluting contaminants which have been constantly regulated over the last decade or so. 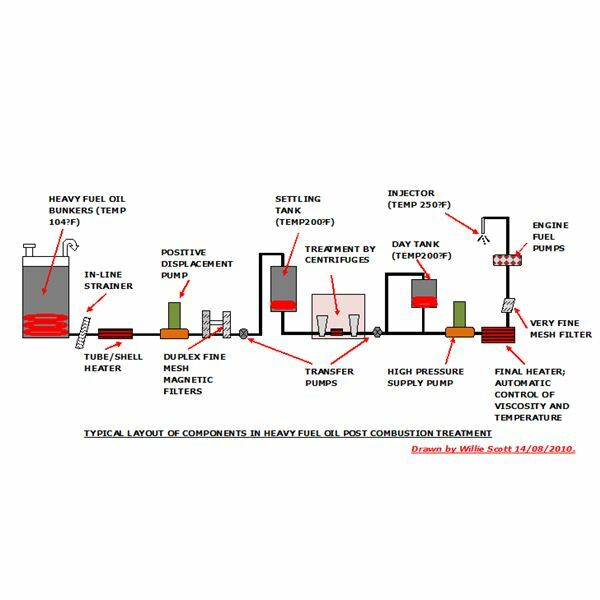 This is a marine article on the contaminants contained in heavy fuel oil, and we shall discuss its production and treatment before being used as a fuel in a marine compression-combustion main engine. We shall also look at the emissions produced from the combustion of heavy fuel oil. We begin then with a look at how the heavy fuel oil is produced from crude oil. Crude oil is usually piped to the refinery directly from its landfall from offshore or from a nearby oil tanker terminal. At the oil refinery it is subjected to dewatering, filtration, and elevated temperatures before being fed into a vertical atmospheric distilling column. Here the valuable petroleum fractions are distilled and drawn off for further processing. The remainder of the crude is known as bottoms, and this contains the heavy fuel oil which is pumped to storage tanks. Heavy fuel oil is used for fuel in steam and motor ships as heavy fuel oil is cheaper than diesel. However as steam ships are becoming less common, we shall look at the treatment of the heavy fuel used by marine oil burning engines. Ships take on heavy fuel oil (HFO) in their bunkers either from a shoreside supply or from a bunker barge. It is pumped directly into the HFO bunkers, usually located port and starboard, for’d of the main engine room, the gases from heavy fuel oil being vented to deck via gooseneck vents. Once the HFO settles, most of the oil will float on top of inherent water at the bottom of the bunkers. This water is periodically drained off into the engine room bilges using a spring loaded foot valve located in the engine room. The bunkers have steam heating coils that maintain the heavy fuel oil storage temperature of 104ᴼF, to improve the heavy fuel oil viscosity for pumping. The outlet piping has an isolating valve and mesh screens that remove the larger solids from the oil. From here the HFO positive displacement pump draws the oil through an oil heater raising the temperature to 150ᴼF. The pump discharges the oil through a set of duplex filters that can incorporate magnets to remove any ferrous particles in the oil, and a transfer pump discharges it into the HFO settling tank. This also has steam heating coils to maintain the oil temperature between 150-200ᴼF. From the settling tank the oil drops down to the separators and clarifiers; the separator removing any water, solids and sludge. The oil then passes through another heater before being fed into the clarifier that removes any remaining solids. The other HFO transfer pump then pumps the oil to the day tank, where it is maintained at 150-200ᴼF by steam heating coils. From the day tank it drops down and through a viscosity/temperature controlled heater raising the temperature to 250Fᴼ, whilst constantly monitoring the heavy fuel oil ready for use in the main engine. As we have seen heavy fuel oil is a by-product of crude refining and is really the dregs of the atmospheric distilling column, sinking to the bottom of the column after all the other fuels have been drawn off. These are soluble elements of nitrogen and sulfur. The sulphur causes rapid wear in the engine due to its acidity, and produces sulphur oxides on combustion. The acidity is controlled by additives of organic compounds. 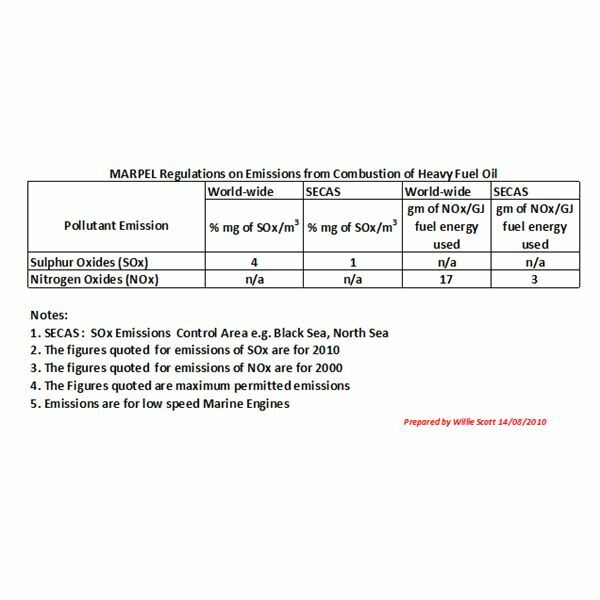 However, the latest IMO emission regulations will require additional post-combustion treatment or the introduction of a scrubber in the exhaust gas ducting such as currently used in shoreside power plants. Nitrogen oxides in the combustion exhaust gases are controlled by maintaining optimum temperature, pressure, and viscosity of the heavy fuel oil as it is supplied to the fuel injectors. Exhaust emissions of CO2 and CO are controlled somewhat by the correct amount and temperature of the combustion air supplied by the turbo-blowers. At present there are no emission regulations for these pollutants. There are normally only traces of these metals in the HFO, however the addition of organic compounds can lessen their effects. In the next article we shall examine the measures taken to ensure the most efficient combustion of the heavy fuel oil, with the least production of air pollutants.